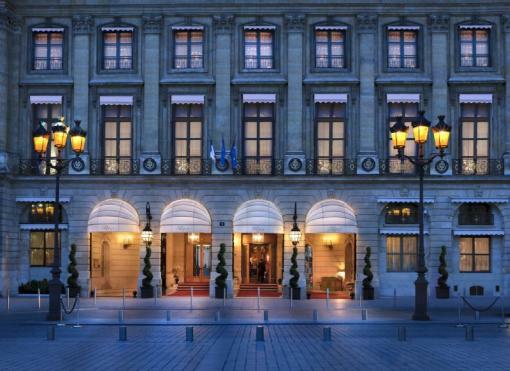 Stepping through the revolving doors of the legendary Ritz Paris can only be described as magical. From its grand lobby and luxurious suites to its charming bars and elegant dining rooms, this historic landmark never fails to stir the imagination and enchant all who stay here. Decorated in the classic French style, the 159 opulent rooms and suites of the Ritz Paris have seen their fair share of famous faces including habitues Marcel Proust, Elton John, Oscar de la Renta and Coco Chanel, who was so enamoured with the hotel, that she made it her permanent residence. Located in one of the loveliest squares in Paris, the extravagance within is matched only by the surrounding sights and luxury boutiques. Enter a world of serenity. Always mindful of the well-being of its guests, the Ritz Paris has created a majestic spa entirely devoted to relaxation, health and beauty treatments. State-of-the-art fitness equipment, group classes, and personal training services are available for custom-tailored personal fitness programmes. Recognized professionals will assist and guide you to maintain your energy and vitality. The most beautiful private swimming pool in Paris is a timeless refuge away from the buoyancy of the city. Frescoes and mosaics inspired by Greco-Roman designs are the ultimate decor for relaxation. Let your mind and body rejuvenate to the lapping of the water and to the rhythm of the underwater sound system. Overlooking the turquoise pool, the Pool Bar provides a restful interlude over a light lunch. The Ritz Health Club is a haven in the heart of Paris, designed for the harmony of body and spirit. In the finest swimming pool of the capital, with a Greco-roman inspired décor, experience the ultimate in relaxation. As water laps in the background, wellbeing takes over with extraordinary intensity. Personal training and state-of-the-art fitness equipment maintain your tone and vitality while massages and beauty treatments allow you to wind down, far away from the bustling city. – two VIP manicure-pedicure and hairstyling booths. The unique savoir-faire of the Ritz Paris will make the most important day of your life even more special. Personalizing a Prestige Salon creating a sumptuous wedding menu, or decorating a private garden, the Ritz Paris is by your side every step of the way and ensures you are able to enjoy this unforgettable event. On your wedding day, the exclusive menus designed by the Ritz Paris will be the delight of both your guests and yourself. The menus are custom-designed according to your wishes and executed by the Michelin-star Chef Michel Roth. – lighting and decoration of the Ritz Club. enhance your evening at the Ritz Club. Ritz Paris child policy: one child up to 12 years old sharing parents’ room free of charge. The 3rd child/person is possible as from some executive rooms onwards. Our superior rooms do not accept an extra cot/rollaway or bed. Faithful to the spirit of French classicism, the Superior Rooms are a subtle, elegant combination of old and modern comfort. Furnished in the Louis XVI and the Regency styles, these surroundings exude a unique sense of refinement with a view of the interior gardens and out to the renowned Rue Cambon. A Superior Room consists of a bedroom with a sitting area and a bathroom. Connecting rooms upon request with one of our reservation agents. The Executive Rooms gracefully embody the essence of French style. Sculptured fireplaces and classical mouldings create the warm atmosphere of early XIX Century Parisian homes.In a comfortable setting fitted with modern amenities, these rooms enjoy a view over the Vendôme Garden, the Cambon Garden or out to the renowned Rue Cambon. An Executive Room consists of a bedroom with a sitting area and a bathroom. Connecting rooms upon request with one of our reservation agents. The generous proportions and unique traditional charm of the Deluxe Rooms faithfully reflect the spirit of the Ritz Paris. Modern amenities are discreetly concealed in the precious décor in the Louis XVI and the Regency styles. With a view out to the Vendôme Garden, the Cambon Garden or the renowned Rue Cambon, so treasured by Mademoiselle Chanel herself. A Deluxe Room consists of a bedroom with a sitting area and a bathroom. Connecting rooms upon request with one of our reservation agents. Charming and welcoming, each Executive Junior Suite consists of a bedroom and a living-room area. Boasting the Louis XVI and Regency style furnishings, these suites are unique and refined abodes with views across the gardens, and all modern comforts. An Executive Junior Suite consists of a large bedroom with a sitting area and a bathroom. A few suites benefit from a separate sitting-room. Connecting rooms upon request with one of our reservation agents. 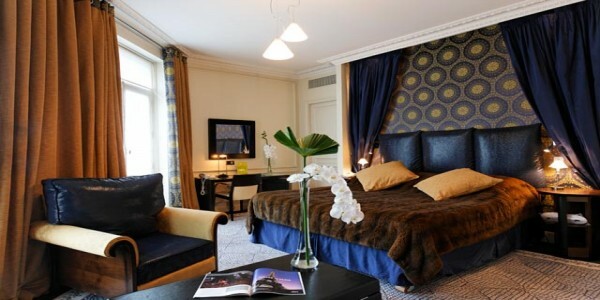 Each Deluxe Junior Suite is conceived in the traditional parisian “art de vivre” style. Each has a living-room furnished in the Louis XVI and Regency styles, with a sculpted fireplace and boasts a combination of spaciousness, refinement and classicism. These extremely comfortable apartments, fitted with a number of modern amenities and with wonderful views over the interior gardens, offer all the comfort of a private home. A Deluxe Junior Suite consists of a large bedroom with a sitting area and a bathroom. Connecting rooms upon request with one of our reservation agents. The hushed atmosphere of the Superior Suites, furbished in rare woods and silks, transforms these rooms into refined and peaceful cocoons. These spacious appartments offer all modern comforts, as well as relaxing views out onto the garden. Each of these suites are comprised of one bedroom, one living-room and two bathrooms. A second bedroom on request. A Superior Suite consists of a living-room and one or two large bedrooms, each with their own bathrooms. Connecting rooms upon request with one of our reservation agents. The spacious and peaceful Executive Suites combine the elegance of Louis XV furnishings with soft, felted Persian rugs. Each suite is comprised of a separate living-room, two Carrara marble bathrooms, and is fitted with a number of modern amenities. The presiding atmosphere of well-being and serenity is further accentuated by the beautiful view of the gardens. An Executive Suite consists of a living-room and one or two large bedrooms, each with their own bathrooms. Connecting rooms upon request with one of our reservation agents. The elegant Chopin Suite is located just steps away from the home of the famous composer at 12 place Vendôme. The décor owes its splendor to the suite’s sumptous ceilings as well as to its 18th century marquetry wood floors. Some claim that on certain nights the opening notes of a mazurka echo through these apartments…This suite is comprised of one bedroom, two bathrooms, and a living-room. The Frédéric Chopin Suite consists of one or two bedrooms, two or three bathrooms, and a sitting-room. “Wherever the Ritz goes, we shall follow,” announced Edward VII, Prince of Wales. Adorned with Gobelin tapestries and Louis VX furnishings, the Suite pays tribute to his exquisite taste and passion for all things beautiful. The pastel hues and floral motives create a bucolic atmosphere, which is perfectly conducive to the imagination. The breathtaking views of the Grand Jardin beautifully enhance this unique and dreamy setting. The Prince of Wales Suite consists of a living-room, one or two bedrooms and two or three bathrooms, one of which has a Jacuzzi. Majestic chandeliers reflecting amber light and prestigious Louis XV furnishings mark the Vendôme Suite’s unique elegance and style, where the warmth of the carmine and ivory surroundings recreate the comfort of a private home. Through the large windows, the view spans across the sumptuous place Vendôme – a detail of the utmost significance. The Vendôme Suite comprises one or two bedrooms, a living room and Carrara marble bathrooms. 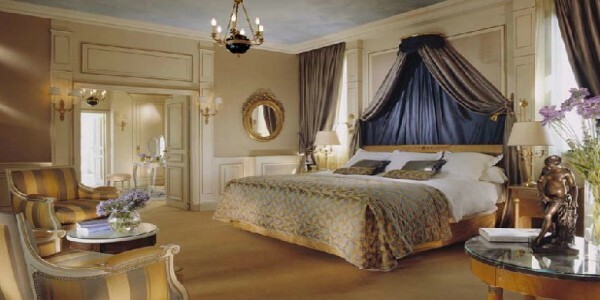 The Vendôme Suite consists of one or two bedrooms, a living room and Carrara marble bathrooms. As a tribute to its founder, this suite prevails over the Place Vendôme, where César Ritz envisioned the most distinguished of hotels. 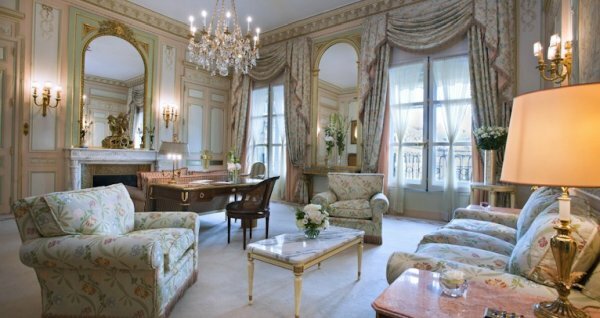 Representing the comfort, warmth and elegance of the “Ritz style” par excellence, the decoration of this unique suite features precious works of art, Louis XV furnishings, and gold-leaf doors that glorify the splendour and intimacy of one of Paris’s most exquisite homes. The César Ritz Suite comprises one bedroom, a living-room, and two Carrara marble bathrooms. 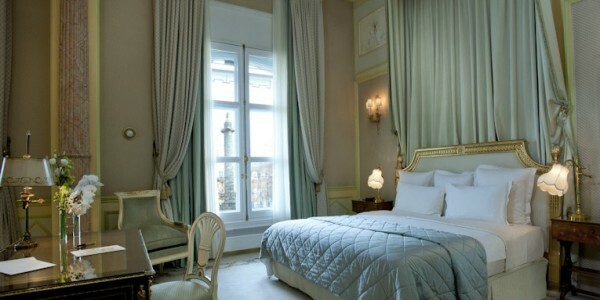 The César Ritz Suite consists of one or two bedrooms, two or three Carrara marble bathrooms and a living-room. A tribute to the famous artist and loyal guest to the Ritz Paris. Overlooking the Place Vendôme, this spacious apartment with soft pink Mansart-style walls is an inspiring haven of tranquility. The Elton John Suite is comprised of one bedroom, a living-room, and two bathrooms, one with a sauna, and the other with a separate shower. The Elton John Suite consists of one or two bedrooms, a living-room, and two or three bathrooms, one with a sauna, and the other with a separate shower. This supremely romantic suite bears witness to a passionate love affair that dramatically rocked the English throne. The Louis XV furnishings and gold-leaf mouldings offer the perfect counterpart to the Wallis blue, a colour dear to the Duchess. The Duke of Windsor is said to have written a portion of his memoirs in this suite, where the vast windows provide a stunning view out onto the Place Vendôme. Breathe in the rich history of this suite and experience the sensation of tranquility. This Prestige Suite is comprised of one or two bedrooms, a living room and two bathrooms. The Windsor Suite consists of one or two bedrooms, a living room and two or three bathrooms. “The Ritz is my home”, Coco Chanel. Exquisite and serene, the Coco Chanel Suite is unique. The elegance and the femininity of the suite is heightened by its breathtaking view onto the Place Vendôme. Amidst the boisterous affairs of parisian High Society in the Roaring Twenties, the famous designer made this suite her home. To this day, Coromandel laquerware, rock crystals and large mirrors pay tribute to Mademoiselle Chanel’s personal taste and elegance. This Prestige Suite is comprised of a living-room, one or two bedrooms, two bathrooms, one of which has a jacuzzi and a steam room, and a view onto the gardens. The Coco Chanel Suite consists of a sitting-room, one or two bedrooms, and two or three bathrooms, one of which has a Jacuzzi, a steam room, and a view onto the gardens. Every detail of this exceptional suite symbolizes sheer refinement and contributes to the imperial atmosphere and grandeur. 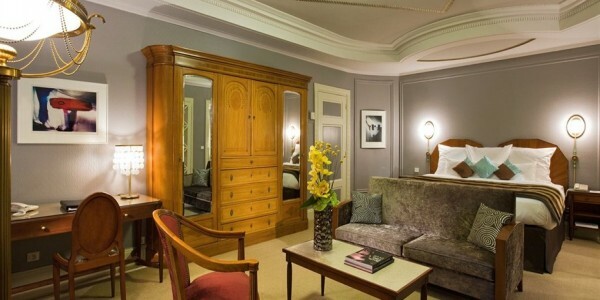 Restored in the French Art Deco style, this stunning suite boasts an impressive succession of rooms. Majestically overlooking the renowned Place Vendôme, these apartments are truly reminiscent of the luxury of days gone by. The main bedroom, with its true to life reproduction of Marie Antoinette’s bed in Versailles under the ample ceiling, is the perfect setting for a genuinely royal awakening. The Imperial Suite is comprised of a large living-room, one to three bedrooms, and two to three bathrooms, one of which has a jacuzzi and a steam room. A reception lounge and fully-equipped kitchen are also available for guests of the suite. The Imperial Suite consists of a large living-room, one to three bedrooms, and two to four bathrooms, one of which has a jacuzzi and a steam room. *A reception lounge and fully-equipped kitchen are also available for guests of the suite. L’Espadon ranks among the finest French gastronomy restaurants in Paris. Critically acclaimed across the world for its refined and delicate dishes as well as for its excellent service, the award-winning restaurant received its second Michelin star in March 2009 and offers a traditional cuisine with a twist of audacity. Soft scents from the gardens fill the patio as soon as the first days of Spring appear. Day’s end is accompanied by birdsongs and the sound of live piano, as conversations follow the flow of a glass of champagne or of a delicious cocktail. The bar offers an exceptional selection of dishes, for a refined business lunch, a light snack, or a scrumptious Afternoon Tea. Lunch from 12:00 p.m. to 2:30 p.m.
Dinner from 6:00 p.m to 10:30 p.m. Afternoon Tea from 4:00 p.m to 6:00 p.m. Conversations flow around the talented Colin Field’s original cocktails in the bar’s genuine décor, complete with its leather armchairs. Elected Best Bar in the World by Forbes Magazine in 2001, the Hemingway Bar is a unique place where refinement and conviviality exist side by side. The Ritz Bar opens from Tuesday to Saturday and turns into an absolute must in meeting places for a trendy Parisian night. Sumptuous buffets showcase flavours from around the world. With live piano music in the background, both sweet and savoury dishes charm the most exacting of guests. In order to accommodate your particular needs and desires, a custom-made play area is available for your children. from 11:00 a.m. to 2:30 p.m.